The New Manchester Turnpike was established by an act of the general assembly on February 18, 1828. A survey was made at that time starting at Hamilton's Ferry which is near modern day Congo,WV, (once known as the town of Hamilton,) past New Manchester and through to the Pennsylvania state line. This was on the property then owned by Thomas Wilcoxon. Part of the road was built at that time by private contributions. In 1848 another act was passed that the state might contribute for it's completion. James Stevenson recieved the contract to grade and construct the road fron New Manchester to the river.The road was not completed until 1852. It continued as a turnpike for only 3 years after which it became a public highway. 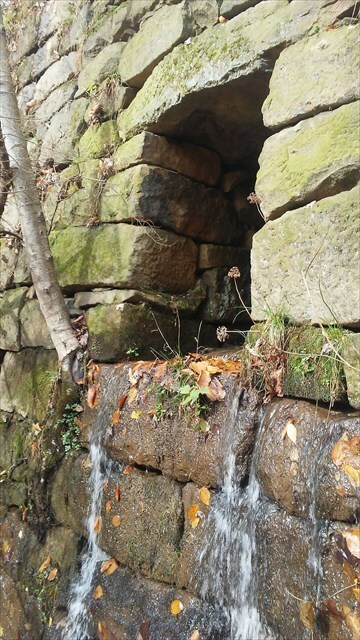 This old turnpike gave the locals access to the millsites in the area including Hartsford Mill where there is another Geocache. It also leads back to the pioner post office at the ELPO Rock geocache. 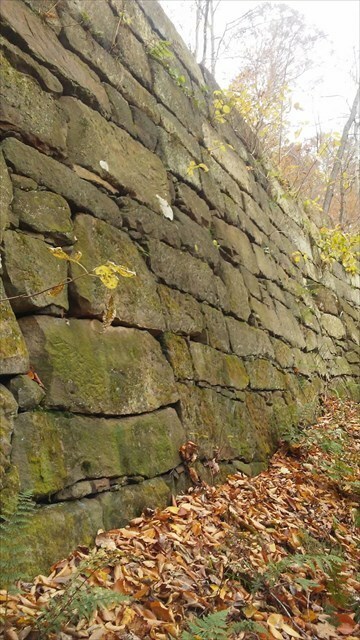 This is a very unique location with a cut stone wall approximately 20 feet high and over a hundred feet long. Just think of the craftmanship that went into building this structure that is still standing and doing it's job nearly 200 years later!! This will be a good stopping place to rest your feet on the hike back to ELPO. Cache is a .30 cal ammo can. Thanks to Craig Heaton, (wd8kdg,) for all the time and effort he spent so many years ago researching this part of the park. Without his help there would not be any Geocaches back in this wilderness area. Onfr bs gur jnyy orfvqr gur ynetr gerr arne gur jngre bhgyrg ubyr. Cut Stone WallThis wall is almost 200 years old and still standing almost like the day it was built. Those old stonemasons were true craftsmen. Water OutletThis view is from ground zero. I am standing on the cache when this pic was taken.